The Reflective Democracy Campaign, a collective initiative funded by WDN members, has just released our latest study, an analysis of the race and gender of candidates on the ballot in November. We looked at congressional and governor races, as well as a sample of state legislative races, and we found some historic shifts. WDN members launched the Reflective Democracy Campaign five years ago, and through our consistent investment, we are seeing results. In the face of the repressive policies coming out of Washington, women, especially women of color, are taking back power and running at much higher rates than in 2012. Since 2012, white men have decreased as a share of congressional candidates by 13%, and by 12% in our sample of state legislative races. At the state legislative level, 36 out of 43 states analyzed saw an increase in women candidates since 2016, and the average increase is 24%. For the first time, white men are a minority of Democratic congressional candidates, dropping from 53% in 2012 to 42% this year. In our sample of state legislative races, Democratic women of color candidates increased by 71% since 2012. The race and gender breakdown of Republican state legislature candidates has remained relatively unchanged since 2012. 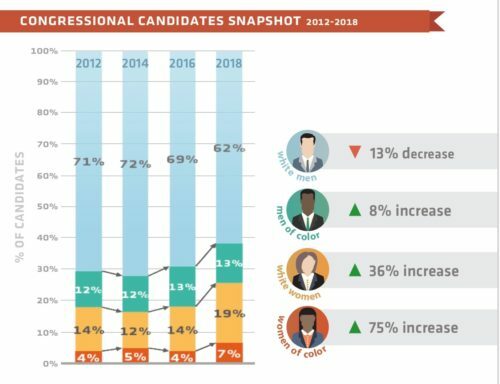 Overall, women candidates for Congress have increased by 44% since 2012—driven by a 75% increase in women of color. « Conference Registration is Open!